Businesses have enormous data and it’s crucial to ensure a proper and a quick backup for the valuable asset! For speedy and secure backup / restore of data volumes ranging in hundreds of gigabytes, IBackup provides physical transfer of data, via a temporary storage device. IBackup sends you either an external USB hard drive or a NAS (Network Attached Storage) device, depending upon the size of data to be transferred. External hard drives are ideal for data sizes of up to 2 TB, whereas the NAS devices suit best for larger amount of data. The NAS devices are pre-configured with RAID 5 storage of up to 5 TB and DHCP. You can plug-n-play the NAS device if you have DHCP servers in your LAN, otherwise configure the NAS device to suit your network. IBackup will provide all the necessary authentication information. You can avail the IBackup Express service, if you have a minimum of 100 GB data to be transferred to or from your cloud account. Express Backups are free, and Express Restores will be charged $99.50 per request. The IBackup Express service includes the return shipping charges for orders within the United States. Orders shipped outside the United States will require the customer to pay shipping fees, paid at the prevailing rate. To view an estimated fee schedule, click here . Quickly transfer enormous data to or from your online account. Throughout the process, your data stays secure as it is stored encrypted with military grade 256-bit AES encryption with an optional private key. After data is physically backed up to your online account, you can continue with incremental backups. Internet bandwidth is not required to transfer data. Install the application on your computer to securely transfer your data onto the device shipped to you from IBackup. Backup your Linux server to the IBackup Express device using command line utility or scripts. Note: The service time does not include the time the drive remains in the customer's possession as it is beyond our control. 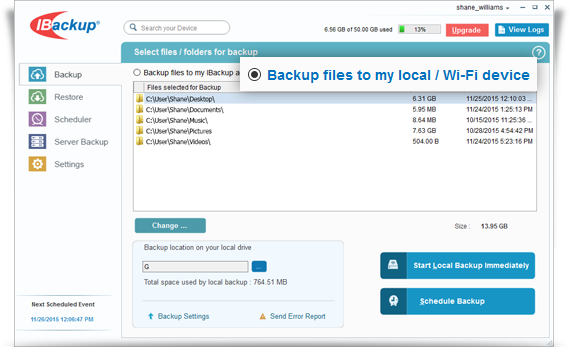 Once you receive the storage device, backup all your data using the IBackup's Local Backup and ship the device back to us. We will transfer your data from the storage device onto IBackup's primary storage devices. Subsequently, you can continue with incremental backups through the online backup process. As per your request, your data is retrieved from the IBackup servers and saved to a storage device. The type of the device depends on the size of your data. The storage device is then shipped to you. All you need to do is connect the device to your computer and restore your data to your system using the IBackup application. You must return the storage device to IBackup, after you have restored your data. IBackup is not responsible for shipping fees or customs fees for international orders. NAS devices vary in size and weight which will determine the cost of shipping. Additional costs may apply if adding insurance to shipping.